The immediate past president of Nigeria, Goodluck Jonathan, was summoned to appear at the Federal High Court in Abuja, and Justice Okon Abang has revealed why. 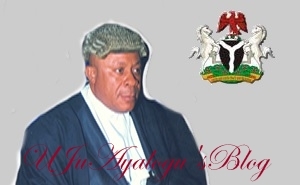 Justice Okon Abang of the Federal High Court in Abuja has given reasons he demanded on Monday that former President, Goodluck Jonathan appear in court on Wednesday. The judge confirmed that he had signed a subpoena compelling Jonathan to appear in court on Wednesday to testify in defence of a former National Publicity Secretary of the Peoples Democratic Party, Olisa Metuh. Justice Abang made the confirmation on Tuesday during the resumed trial of Metuh and his company, Destra Investments Limited, on seven counts of money laundering involving alleged cash transaction of $2m and fraudulent receipt of N400m meant for procurement of arms from the Office of the National Security Adviser. ‎Abang said he received Metuh’s application for a subpoena to be issued on Jonathan at about 3.59pm on Monday.